A more scenic course through Savannah’s historic streets will greet runners in the 2nd annual Rock ‘n’ Roll Savannah Marathon & ½ Marathon on Saturday, November 3rd. In addition, race organizers announced the American Cancer Society as the new benefiting charity. The race debuted in 2011 with the largest inaugural half marathon in the U.S., selling out with more than 23,000 entrants. Runners will once again start downtown at historic City Hall, touring through the stunning homes of Gordonston, the southern charm of West Savannah, and past William Grayson Stadium before an exciting finish alongside Forsyth Park. The revised course will pass by three of the city’s iconic downtown squares and marathoners will enjoy a tour of the Savannah State University campus. Changes were also made to lessen impact on the surrounding community and to reduce marathon miles along Truman Parkway. Neighborhoods on the south end of the marathon course will experience fewer road closures. Beyond rolling out of bed and walking two blocks just in time to see the full marathon leaders gallop past the corner of Drayton and Anderson streets, I didn’t participate in the inaugural Rock ‘n’ Roll Marathon in Savannah last fall. The event was for the most part a big success, it seemed to me, despite ridiculously over-optimistic projections for increased sales tax revenue, despite a poorly planned registration system that caused a huge traffic tie-up getting onto Hutchinson Island, and despite some moderate complaints that the course did not fully take advantage of Savannah’s sheer beauty. 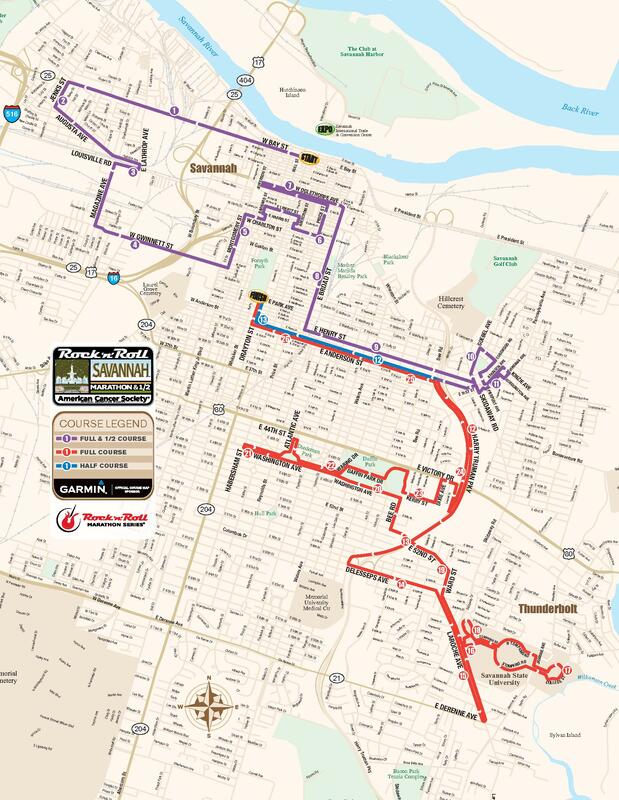 So it’s great to see Gordonston, SSU, Washington Avenue, and downtown squares incorporated in this year’s route. I’m guessing that the field will be sufficiently spread out by the time runners get into the squares.